Looking to Upgrade Your Furnace? Let Lozier help! 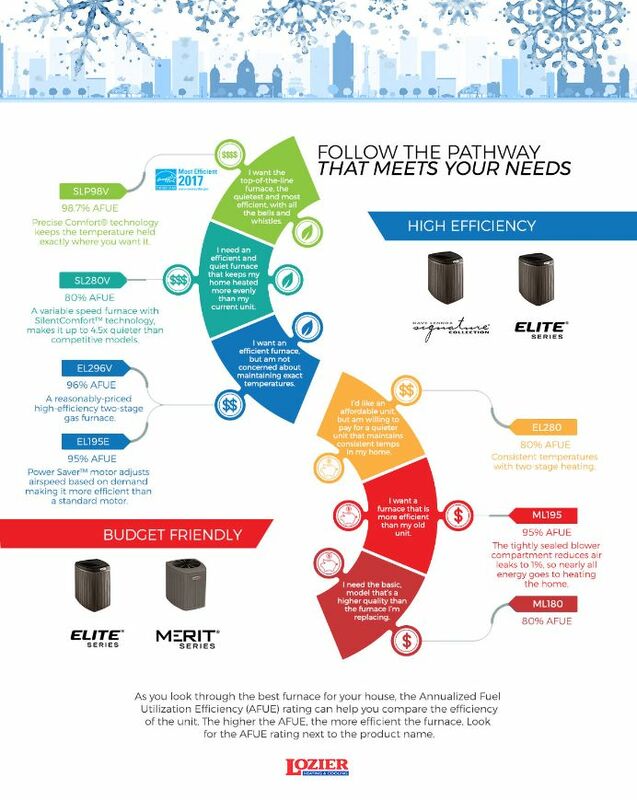 The steps you take before you upgrade your furnace can make a significant difference in comfort, energy costs and durability. For example, modern combustion furnaces are highly efficient at turning natural gas into heat energy. As a result, replacing an old furnace not only will save you money, but can lower your environmental footprint, too. Other factors to consider include selecting a first-rate HVAC contractor and choosing the right system size. Choosing a new furnace for your Des Moines area home is not a decision to take lightly. We've created a simple guide to help you select the right furnace and included more tips below. Improving home energy efficiency can help lower energy costs. Sealing air leaks and adding insulation where it's inadequate can reduce the amount of heat your home will need. If you're unsure about where the leaks are or where to insulate, consider getting a free professional energy audit. Some HVAC contractors and licensed energy auditors use specialized equipment to find and measure where thermal losses are occurring due to air infiltration and inadequate insulation. MidAmerican Energy will audit your home for free under their HomeCheck® program. You should also consider the efficiency of your furnace by locating its AFUE rating (annualized fuel utilization efficiency). Measured as a percentage, the higher the AFUE number, the more efficient the furnace is at converting fuel into heat energy. In the 1970s, the average gas furnace had an AFUE rating of around 65 percent. Today, the lowest rating allowed by law is 78 percent. High-efficiency condensing furnaces, increasingly popular in American homes, fall in the AFUE 95-98 percent range. In general, the more efficient a furnace, the more it will cost. However, the extra initial cost will be offset over the lifetime of the furnace in the form of lower energy bills, particularly in locations with cold winters, such as here in Iowa. In warmer climates, a cheaper, less efficient furnace could prove to be the smartest purchase. Before purchasing a new unit that is the same size as what you have, schedule a SAVE-certified tech to evaluate your needs. Going by the size of your existing furnace can leave you with a system that won't keep you as comfortable in your home, while raising your energy bills and repair costs. If the system is too large, the furnace will frequently cycle on and off, causing unnecessary wear and tear on its components, wasting energy and allowing you less control over the temperature of your home. On the flip side, when heating systems are too small, your home won't be heated properly - particularly when the cold clamps down for the winter. Lozier uses software called Manual J to determine the right size. To help determine the appropriate furnace size, it takes into account the cubic footage of your home, its energy efficiency, floor plan layout and lifestyle factors. Although the load calculation requires some time and detailed information, this is the most reliable way to avoid purchasing a system that's too large or small. Factors such as the quality and amount of insulation also should be considered. In furnace sizing, load calculation is measuring the Btu/h or energy that needs to be added to a space by the heating system to provide the desired level of comfort. Your HVAC contractor will calculate your home's heating load based on areas where it loses heat, including around windows, doors, roof, exposed walls, walls that aren't sufficiently insulated, basement floors, cracks, holes and other potential areas where cold air may infiltrate. Consult with your trusted Lozier heating and cooling professional about a reliable and efficient brand of furnace. Then make sure you maintain it annually over its lifetime, as well as regularly changing air filters. The contractor you choose can make a difference when upgrading your furnace, particularly in terms of its sizing and installation. All furnaces are complex because they use combustible fuels. Choosing a contractor who is a factory-authorized dealer for a major HVAC manufacturer indicates that the contractor excels at installation and service. If it’s time to upgrade your home’s furnace, contact the local Des Moines pros at Lozier Heating & Cooling. We're a Lennox-authorized dealer and have proudly served homeowners in the Des Moines area since 1906. Our skilled HVAC technicians help homeowners understand which furnace is best for their homes, and support the health of your home unit with regular maintenance.